Ordinarily, we try to keep the tone and style of our foster dog blog as light and fun as possible. We strive to be totally honest, but keep things positive. There are so many sad stories out there already about the plight of animals and how the world and society have wronged them – you don’t have to go far to find these stories. Ordinarily, this is not a source. But then we met Blue. Our journey with Blue has only just begun, but we can already see that it’s going to be a challenging one. We don’t know what this little girl has been through in her two short years, but we know that life has been scary and sad and given her reason to mistrust the world. We hope that with the right combination of care and training by us, and the right adopters down the road, Blue will live a happy, fulfilling life. We feel that the challenge ahead of us is a daunting one: the road of rehabilitation is long, and patient, experienced adopters willing to work hard with an emotionally wounded dog are hard to come by. The other day I picked up her file from the shelter. Within, I found all of her records from animal control, the vet, and the behavioral evaluator. On those pages I found fragments of the story of Blue’s short life. Blue was picked up as a stray in bad shape. She was emaciated – weighing just 40 of the 55 pounds she now weighs. Her fur was patchy, with large portions missing. Her back legs were swollen and red, appearing painful to the touch. She had red sores on all of her feet and ankles. She had had puppies. She was described as timid. A little fearful. Quiet. The good people at the Montgomery County Humane Society resurrected her. She was seen by vets, treated for a host of skin conditions, and put on a weight gain diet. She was walked by staff and visited regularly by dedicated pit bull-loving volunteers. She learned to cope with shelter life, but always remained a little shy. A little reserved. A little reluctant. She lived in this limbo for almost three months. So we pulled her. We thought—once we bring her home to a stable, warm environment, we will be able to fix her. She will learn to trust and love. Turns out it’s not so simple. The best way I can describe this girl right now is conflicted. Sometimes, she is happy and confident. Other times, she is anxious and panicky. Some people she trusts with all her heart, and other people make her need to cower, bark, and growl. On the first day, she wouldn’t eat in my presence. Since then, she won’t eat unless I’m right by her side. She took to me immediately and has been nothing but love and snuggles since I picked her up at the shelter. With foster dad it has been the opposite. Initially, she could barely be within 15 feet of him without displaying tons of calming/fear signals, interspersed with barking and growling. Luckily the love of my life has the biggest, kindest, most patient heart, and is working hard with her to teach her that he is not scary and dangerous. We met with a behaviorist over the weekend to talk about how best to proceed, and he reminded us of one of the most important and difficult parts of healing a dog like Blue: we can’t just snuggle her fears away, and it’s going to take a lot of diligent work and time. And even then, you can’t know for sure that you will succeed. 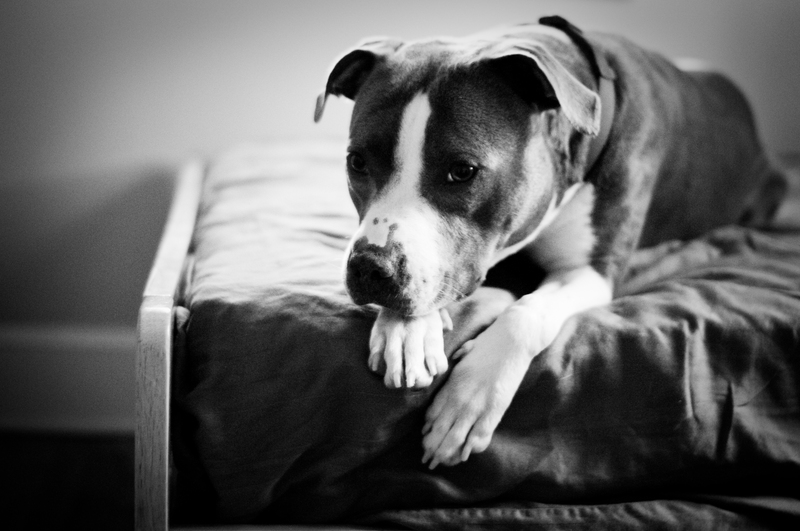 Experts say that it is usually possible to rehabilitate a fearful dog. Rescuers say they are the hardest ones to work with but also the most rewarding. Our brains say it’s going to be all new, exhausting, and that there are no guarantees. Our hearts say we’re willing to give it a try. « A new blog feature! Heartbreaking to read. All I can say is how happy I am that she found you two as the humans to stand by her side as you work through her past. It will be worth it and know that I’m thinking of you guys everyday and wishing all the best. Poor you and Blue. Such a sad story of her previous life. I know she’s in the right place to be rehabilitated living with you. I hope it goes smoothly even if it takes a long time. Give that lovely girl a big cuddle for me please. How sad. I’m glad she is getting this second chance. We will keep paws crossed for her. If there is anywhere she can thrive, it is with you guys. Poor girl, at two to be so untrusting. Im sure it will be a lot of work, and were here to listen! this had me tearing up on my metro ride in. especially the “we can’t just snuggle her fears away”. i think sometimes we think we can, or hope we can anyway. 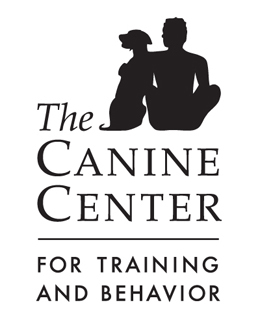 it’s great that you guys are working with a behaviorist to get some help. and kudos to your husband for being so patient and understanding. i bet that’s hard on so many levels (there really is nothing more sad than when a dog is scared of you). wishing you guys great progress! So many times the people involved in rescue are women. Did anything in her short history of rescue show that she had issues with males? Just curious. Good question. Since I’ve had her (Wednesday afternoon), she has seemed much more comfortable with women than men. She is an absolute snugglebug with me and our female dog walker, and was happy to greet the female check-out person at the pet store where we picked up her new tags. She is not fond of Ben yet, and did not like the male store manager at the pet store. She also didn’t like a male neighbor the other day on a walk. However, she did fine with everybody at the shelter where she lived for almost 3 months. Most of the kennel staff are men, and there were no reports of fearfulness, aggression, or anything else with her then. That’s the strangest part, I think. Well, I did tell you that at first she seemed fearful with me and had growled at me before but by the time we were showing you around she had gotten pretty comfy with me. I bet that she will get comfortable faster than you expect…it seemed like the way it went with me was 1st she was scared and defensive….then she was more trusting and will sniff but obviously still be scared. Once it got to that point it seemed to really pick up momentum and she got great pretty fast! I hope that the experience proves to be the same for you guys! I figure I would see her maybe 3-4 days a week for just a short period of time so with you guys being there even more often maybe it will happen even faster. train train train… one of the few ways I feel you can build a fearful dogs confidence is through training. From the simple sitting or standing still rather than dashing during fearful moments to more advanced ignoring of said fears by looking to you. I always tell people it is much easier to train a cocky, obnoxious, over confident dog than a fearful one. But I agree getting dogs over their fears and getting a calm dog from training is awesome. We had a pit in recently who shook and laid in the corner for the first 1.5 weeks of being with us. Then she did it less often, and by the end of the month would relax and lay on her bed until we took her out for her walks/training. The road can be long for sure, and I agree that you can’t cuddle her fears away. Best thing you can do is provide her structure, exercise, rules & boundaries to remove the “worry” from her life and love. Keep us posted on the “real” moments of this girl, it probably would help a lot of people out. And I’m sure your readers would not mind at all. Almost all of my foster dogs have been of the tentative nature, and it really can be a challenge. We ended up keeping the latest one, because I adore his lazy side just as much as I love how feisty he can get when he’s truly comfortable. He is most at ease outdoors, and when we’re watching squirrels or hiking. However, he has come a long way since we first started fostering him in October. He still growls when he’s unsure of a person or another dog (never ever has he bit or attacked anyone or anything), but responds well to corrections and positive reinforcement. Even though he can be a real grump, I adore him despite this flaw and see it as a quirk at this point as long as we keep it in check. Good luck with your journey with this beautiful girl! I am sure she will come out stronger and more confident in your care. That’s so sad that Blue’s life has already been such a hard one. I’m glad you guys are working with a behaviorist to sort out the best way to help her overcome her fear and anxiety. I hope that through increased training and socialization she’ll be gain some confidence and trust in people! Blue’s behavior sounds a bit like our Sadie when we first got her. It took us a long time to get her to be a happy, well-adjusted dog. I’m confident you guys have what it takes to get Blue there as well. Lots of positive reinforcement, building her confidence and don’t underestimate the importance of those snuggles! I found that the more Sadie trusted us and started to relax, the easier it became to train away the fearful behaviors. Snuggling goes a long way in building that trust. Good luck! Thank goodness Blue has you!! What a story! All of our fearful fosters seemed to be much more comfortable with women than men – it may be because most of the shelters my rescue works with have a majority of female employees. It could also be because of their unknown history…it’s hard to tell. The best tool for me has been food. Whenever we have/had a new person come into the house, they immediately had treats available. There was no direct contact such as petting or talking to the fearful dog until he/she came up to that person to sniff and check them out comfortably. Also, I agree that it is so much easier to imagine working with a dog in your own home and schedule than it is to prepare them for adoption into a new home. 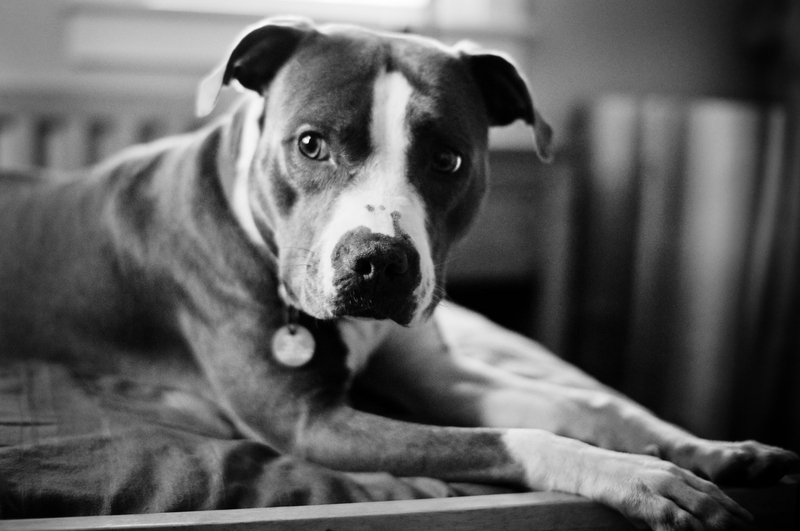 Part of the reason we kept our pooch is because I knew that I could handle his issues, and we had already had him for 5 months before we adopted him….I was attached and ready for the challenge. However, our other fearful fosters found wonderful and cooperative foster homes, so there’s hope! I believe that if anyone can bring Baby Blue around it will be you. Look at all you did for Lollie with her troubled past. I wish you luck, and hope that Blue realizes soon what a great foster family she has. Poor Blue — Lady got the blues! Your Dog’s Friend can be another resource — beyond the workshops they occasionally offer about fearful, anxious, or other emotionally challenged dogs. Free phone advice, trainers who specialize in these kinds of behaviors. See http://yourdogsfriend.info. Good luck, Alex and Ben — I’ll be following your progress as with all of your other fosters, and I’m so glad you’re up to working with Blue and that she’s landed in your care. Poor Blue. If only it was as easy as telling her she will never have to worry about finding a home filled with love again. If only dogs understood everything we want to say, everything we want them to know. I am so glad she has found her way to you, to people who won’t give up on her and will help her find that lovely little soul lurking inside. Congratulations on your new foster! I wish you the best of luck and if there is anything I can do to help, please let me know. I wish you and your husband all the best with Blue. I hope she thrives with you and can move on to find her forever home. Thanks for stopping by earlier, you’re right, I’m quite behind on the blogosphere so I hadn’t heard about your latest foster trials. Sorry it’s been so rough, well done on taking on such a challenge and hanging in there. It’s so sad to gear her story, and especially how things happen that such a story should even exist. We don’t have much experience with fearful dogs, so we are so interested to hear about the process with Blue. We know if anyone can do it, it will be you guys! Blue is so incredibly lucky to have found you, and as time goes on I know that you will feel lucky to have found her. You will both learn so much from each other. We adopted a scared, shy 18 month old pit-mix three short months ago and watching him grow into the much more confident, loving young boy that he is now has been one of the most rewarding experiences we’ve ever had. Obedience training did wonders, as did lots and lots of patience. We had the same issue with trusting “Mommy” over “Daddy,” but with time that too has subsided. Not every day is a step forward, but the challenging days are now few and far between. How is Blue with Chick? Your home is exactly the right place for her to learn to trust – have faith! You will provide her the steady, calm routine that she needs to stop panicking. You’ll give her things to focus on to replace the fears that guide her now. You’ll teach her behaviors and responses that let her know she can handle herself and the world. You’ll praise her so that she knows she’s done a good job. We went through so, so much with Toni when we brought her home. She was initially afraid of men as well, so we armed the men in our lives with treats to earn her trust. We thought she was well-mannered (and she is) but she was really sort of frozen in fear – hoping that if she didn’t attract too much attention, nothing bad would happen to her. The agoraphobia – I can’t even begin to describe the challenge of that! I wouldn’t change a thing about all that we put in to helping her work through it. To see her run around our yard now or roll on her back in the grass or snuggle on a (male) dinner guest’s lap – it was so worth it! Please don’t hesitate to email me with questions! We haven’t been through it all, but we’ve been through a lot – if our experience can help you to help Blue, I’m happy to share. This is one of the toughest situations to go through…we’ve struggled with Nyxie’s fears since she was a puppy. It’s a long, consistent road, but she’s worth every struggle. You are amazing people and are well-equipped to handle this. I can’t wait to cheer you on through this foster! If there is ANYTHING I can do to be helpful to you through this? Don’t hesitate to let me know. If anyone can bring Blue some peace, it’s you guys. I would offer advice, you you are in very capable hands! There should be more people like you in the world. Heartbreaking but at least she is in the best of hands. This post really hit home with me. I can’t help but think about our boy Boss and know matter how much we loved him we could not fix him. You guys will be in my thoughts a lot with this little girl, I know if anyone can get her to trust and love again it will be you guys. Good luck and give that sweet Blue a kiss for me. Unfortunately, the way babies (and puppies) are raised rewires their brains and bad early experiences can cause all kinds of problems. The good news is that the brain is amazingly flexible and can recover all kinds of things thought to be lost. I hope you can bring some peace to Blue in your time together. I certainly know you’ll do everything you can. Blue is a lukcy pup. Felix was very fearful/aggressive when we got him. He would physically get between my and my man. Any time he was dominant (ie. leaning over to kiss) Felix would snap. Now he is a total Daddy’s boy. It was hard, it took a long time to bring him around and I can’t imagine going through it with a big dog. Blue is oh so very lucky to have an amazing foster family like you. Slowly but surely, you’ll build this sweetie’s confidence! 😦 This makes me sad, but I am also hopeful that there will be a happy ending for her. Wishing you the best of luck. Love her already. The first picture reminds me of some of the amazing ones you took of Dan. And also Alex…..if Bigwig can learn to love Kristina in 1 month I believe that Blue should be able to do it too…she’s nowhere near as big of a jerk as my bundle of joy! I have all the faith in the world that all that good energy you guys give off is going to change Baby Blue’s whole life! I just found this blog through a fb friend. I love this particular post. We, too, are foster dog parents, and our current pup has had a tremendously rough go of things. By all accounts, he should be dead. He was saved by some very brave children who pulled him from a dumpster and rushed him to a nearby vet. Pirate (so named for the lost eye due to the beating) is an amazing dog and daily teaches us something new about trust and love. Reggie had a lot of fear aggression when I adopted him. Very similar to what you’ve described. It took a long time for him to feel safe. In fact he’s still not crazy about strangers approaching him. He wants to meet new people on his terms. But I really believe that the love and compassion you’re sure to give Blue will win the day. Progress may come in baby steps, but he will understand.